Find My Workspace lists over 95% of the serviced offices market in Charlottenburg. Simply click Request Quote to check pricing for one office, or Add to Basket for multiple offices. This centre offers beautiful offices with spectacular views over the radio tower and the famous Kaiser-Wilhelm memorial church. Offices are around 23 m² and there are meeting facilities for up to 10 people so it is highly adaptable and extremely convenient. In addition to these well designed spaces, you can benefit from a range of high quality services, all provided at this centre to enable your company to flourish under prestigious conditions. For instance, this centre is accessible 24/7 and offers administrative and IT support, as well as reception services that will handle your telephone answering with the utmost professionalism. This impressive modern building designed by the well-known architect Helmut Jahn offers a range of fully furnished and serviced offices. It also boasts a host of features, including an on-site gym and cybercafé. 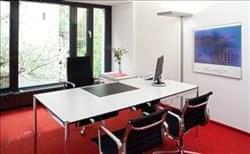 In addition, your company can make full use of the videoconferencing facilities and reception services. This centre is well equipped to accommodate a range of businesses, especially IT support provided for the site’s shared internet, keeping all tenants well connected throughout their occupancy. There is administrative support provided so that operations can run as efficiently as possible. A fabulous sloping glass frontage gives this centre the ‘wow factor’ at street level, as well as offering fantastic views of the long tree-lined boulevard from the airy workspace inside. This is a high-tech quality building with flexible lighting and natural stone flooring set in the prime central business district known as City West. It’s sure to impress, and not just because of its looks. The space offers high quality services that will enable businesses of any background to flourish under excellent conditions. Here, you can benefit from a board room, administrative/IT support, conference facilities, reception services and a cafe onsite at which you can recharge and stay focused. This business centre offers 1.450 qm with 34 exclusive full furnished office rooms to welcome your guests perfectly. Surrounded with original brick walls this superlative business center provides history-charged ambiance mixed with livelier business club atmosphere. The charming conference room “Turmzimmer” with ornamental ceiling beams and chandelier as well as the big light-flooded conference room with a ceiling height of 6 meters, are equipped with elegant design leather armchairs. A special highlight is the roof terrace with a top view over Berlin. This great variety of possibilities ensures the perfect setting and atmosphere for your business meeting and working ambiance. This centre is located on the Kurfuerstendamm, notably the best address in Berlin. This 5-star centre opened in 2008 and is housed in a prestigious period building. The centre offers exclusive design, excellent service and cutting-edge technology. 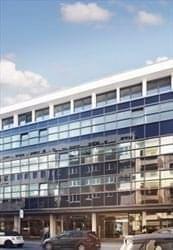 This modern business center is located in an attractive side street leading off Kurfürstendamm, in close proximity to Savigny Platz. Here, a warm welcome from the customer service team is always awaiting you and your guests. Fully equipped offices as well as conference and meeting rooms can be rented on flexible contract terms. The private and team offices, together with the individual workstations in the shared office, are flooded with light and equipped with modern office and communication technology. Rent your office on an hourly or daily basis for months or over years – you will always benefit from this centre’s extremely attractive prices. To obtain information for your selected Charlottenburg Serviced Offices, please tick the "Add to basket" box for each office you prefer and complete the form below. We will then send a detailed report via email.